Home TET TET Links TRB News TRB TNTET Paper1 Cutoff (Expected) Published. TRB TNTET Paper1 Cutoff (Expected) Published. TRB (Teachers Recruitment Board Conducts Teacher Eligibility Test For Tamilnadu Teachers. August 2013 TRB conduct TET - 2013 Paper 1 & Paper 2 Exam. But TRB faces lot of challenging key answer cases & relaxation oppose cases, weightage oppose cases. So TRB delay it's process for appointing Teachers in tamilnadu schools. Now TNTET Paper2 Final weightage list will published. But still now TNTET Paper1 new wightage list is not published. Also TRB not publish final no of vacancy list (Backlog vacancy + Current Vacancy). 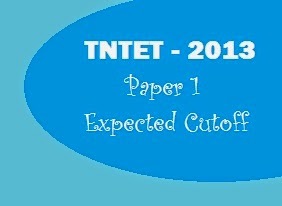 So we calculate tntet-2013 paper1 Expected cut off marks basis on several website's comparison form entries. This calculation is purely tentative. Please note: This calculation is not depth & clear. This is only expected & tentative cut off marks only. TRB only announce the final proper cutoff. But This expected cutoff gives you only a approximate idea.